January 10. A band fronted by a guy dressed up like a clown. Could only be a gimmick, right? 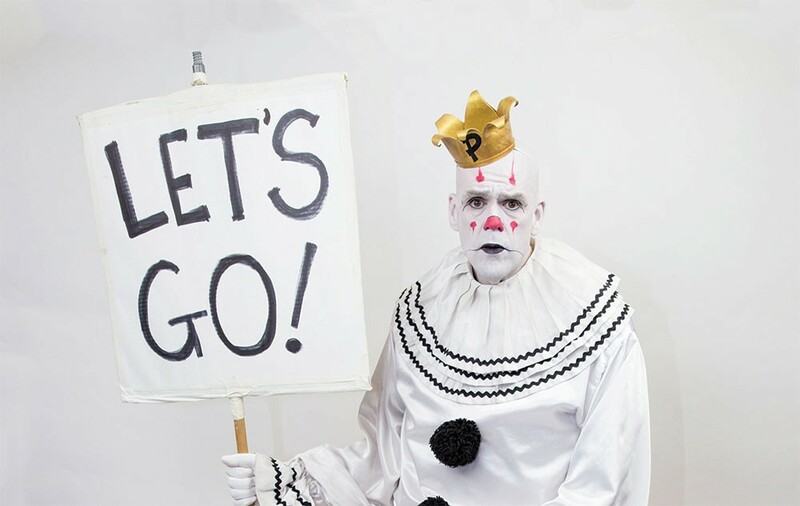 Well, you might just end up rethinking that once Puddles Pity Party singer Puddles the Clown (AKA Big Mike Geier) steps up to the microphone, opens his mouth, and unveils the most robust baritone since Tom Jones. Called "the Sad Clown with the Golden Voice," Puddles/Geier launched the act in his native Atlanta in 2013 after doing time in the tellingly monikered Greasepaint. Since then he's taken the melancholy cabaret on the road, touring with Eels, Aqua Teen Hunger Force, and others in the US, Europe, and the UK. 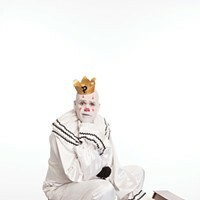 Puddles brings his circus of sadness to Daryl's House this month. (Darlingside and the Dupont Brothers dial it in January 13; the Cherry Poppin' Daddies riot January 14.) 7pm. $25-$35. Pawling. (845) 289-0185; Darylshouseclub.com. January 16. The location where alt-roots duo the Stacks first met, a Prohibition-era-themed blues club in New York, is a good indicator of their sound. "A conversation turned into a four-hour jam session and a duo was born," says their website. The pair, which makes this wayside stop at the Rosendale Cafe, is comprised of guitarist Andy Stack (Jonah Smith, Suzanne Vega, Buffalo Stack) and guitarist/violinist Tania Elizabeth (the Avett Brothers, the Duhks, Mary Gauthier). Guitar magazine singled out Andy Stack's playing as "surprising, soulful, and always in the right place," while American Songwriter praised Tania Elizabeth's chops as "nothing short of mind-blowing." (Lara Hope and the Ark-Tones rock 'n' roll January 9; DUM Turkish Rhythm Celebration drums it up January 22.) 8pm. $10. Rosendale. (845) 658-9048; Rosendalecafe.com. January 22. Not to be confused with either the identically named 1970s West Indian disco trio or the 1980s Ohio blues punkers, these Gibson Brothers are tops on today's traditional bluegrass circuit. Leigh (banjo) and Eric (guitar) Gibson, who hoof it to Infinity Music Hall for this winter hoedown, hail from the Dutchess County farming hamlet of Clinton Hollow and have roped in multiple International Bluegrass Music Association awards for their blazing chops and airtight harmonies. "When I hear someone like the Gibson Brothers, I know it's them from the first note," said none other than Del McCoury. "They have that little thing in their voices that no one else has." The duo's 12th and latest album, 2015's Brotherhood, comprises covers of such superlative sibling acts as the Everly Brothers, Jim and Jess McReynolds, the Stanley Brothers, the Blue Sky Boys, and the York Brothers. With the Zolla Boys. (Kathy Mattea croons January 14; Johnny A jams January 15.) 8pm. $29-$39. Norfolk, Connecticut. (866) 666-6306; Infinityhall.com. January 21. Thunderhead Organ Trio is yet another in the long line of reliably intriguing bands featuring keyboardist Neil "Nail" Alexander, who in addition to working with jazz greats Gunther Hampel and Alphonse Mouzon spent many years in popular Pink Floyd tribute band the Machine and celebrates the music of Weather Report and the Headhunters with the trio Mr. Gone. Joining Alexander in Thunderhead Organ Trio, which makes this hit at the Wherehouse, are two of his fellow musical pros, trombonist Joe Gil (David Murray, Sonny Fortune, Willie Colon) and drummer Jason Furman (Arturo Sandoval, Diane Reeves, Joe Williams). Jams will be had. 8pm. Call for ticket price. Newburgh. (845) 561-7240; Thewherehouserestaurant.com. January 30. The longest-running vocal trio in Jamaican musical history, the Mighty Diamonds, who come to the Bearsville Theater this month, trace their deep roots back 46 years. The group—Pat "Lloyd Ferguson" (AKA Judge Diamond), Donald Shaw (Tabby Diamond), and Fitzroy Simpson (Bunny Diamond)—came together in 1969. They honed their sugar-sweet harmonies under noted producers Stranger Cole and Rupie Edwards before cutting their first hit, 1973's "Shame and Pride," under another iconic producer, Byron Lee, going on to wax 1976's Right Time, one of reggae's acknowledged classic albums and work with recently departed New Orleans legend Allen Toussaint. "Pass the Kouchie," from 1981's Changes, was redone in 1982 by Musical Youth as the hit "Pass the Dutchie." (Brian Fallon and the Crowes land January 8.) 8pm. $20, $25, $50. Bearsville. 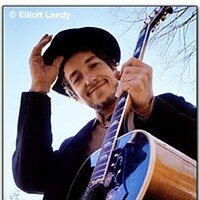 (845) 679-4406; Bearsvilletheater.com.